The BMC Mini is one of those motoring icons that is instantly recognizable anywhere and is known for its compact package, large usable space and cat-like reflexes. 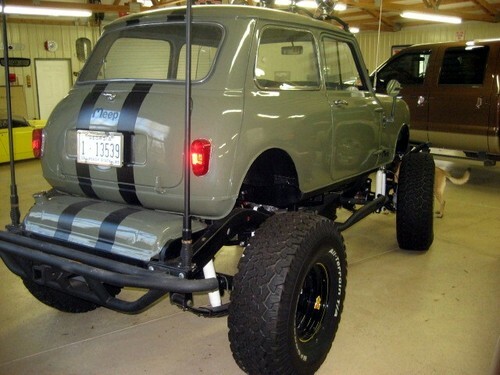 Throw all you know out the window and expect women and children to scream at the sight of this monster truck style Mini wherever you go. This 1965 Meep is for sale in Hampton, GA currently bidding on ebay for $12,000, with a buy it now price of $15k. It is fitting that Meep-Meep is the noise the Roadrunner always makes because we couldn't pick a better car for the Coyote to pack with dynamite and chase after that pesky seed eating menace. The custom nature of this Meep would of course mean that it would fail in a catastrophic way right before the pointy tailed punk meets his doom, but we'd have done some fantastic off-roading in the Southwest desert before the nitroglycerin blows our Coyote fur into a flower petal shaped necklace. 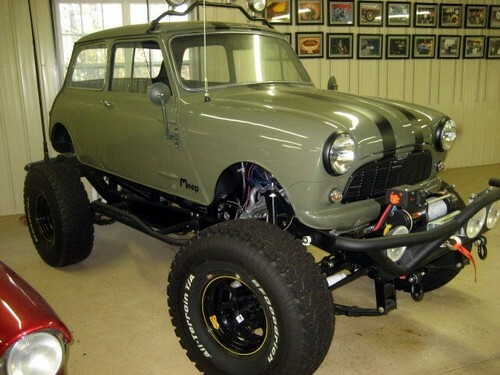 We are beginning to suspect that nothing Mini related was harmed in the building of this hotrod, and the chassis looks to be sourced from a Jeep YJ frame with a 1/2 foot lift kit. 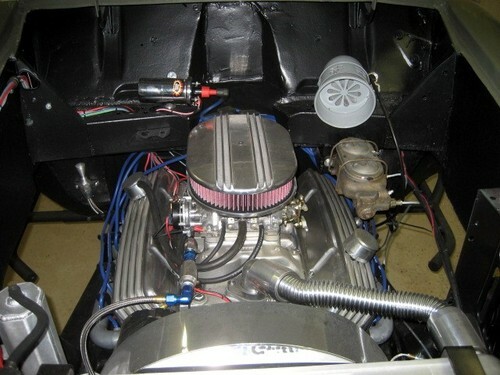 The engine is a 350 cubic inch Chevy crate motor, probably good for 350-400 horsepower. The Mini body looks comical mounted between the Jeep axles, but the execution looks nice, aside from the odd looking '30s Ford style painted gas tank just aft of the Mini hatch. Regardless the approach and departure angles look aggressive and this will certainly be more competent off road than say...a Mini Countryman. ~ is there really a seat for every saddle? I want this more than a fat girl wants a guy to pick her up before the bar closes. ~ 2am and the 285 pound weight limit has been waived. who needs a saddle after all. The winch motor is about the same size as the 850cc motor that came out of the Mini. At first glance I almost thought the winch motor WAS the Mini's original motor! And, by the way, Road Runners are carnivores. Sort of makes sense in regards to the hundreds of hours of fruitful/wasted/awesome/stupid work that went into this monstrousity. The only thing that would make this better would be if someone from Britain bought this and shipped it back home! Sure beats those 10 inch wheels on the original. This thing makes one ask "why??" but nevertheless, a very cool rig.